The FlexyICE (formerly known as LPC dongle) is made by Artec Group, based in Estonia. It costs about EUR 160 (2009-11). 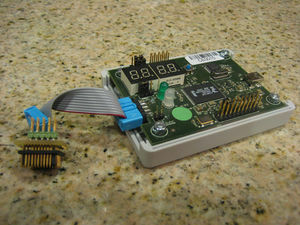 The FlexyICE connects to a computer via USB. It connects to the target via an LPC header. The FlexyICE comes with free software and full schematics (scroll all the way to the bottom for download links, or click on the CVS: browse link near the top). The host-based software is written in Python, and works just fine under GNU/Linux. The FlexyICE has 16 MByte of onboard memory, divided in 4 banks of 4 Mbyte each. The 'mode-selection' jumpers allow selection of each bank: 00, 01, 10, 11. The dongle also has two 16-segment LED displays that can show POST codes. If you hold the reset button on the dongle, the second LED will show the version of the VHDL you have - currently 03, 04 or 05. Artec Group provides a tool to upgrade the VHDL on the dongle that can be run under GNU/Linux (it's a python program). They also provide the binary image for the v5 of the VHDL. Of course all sources are available to build that binary image, but currently proprietary software on Windows is needed to do so. You will need a byteblaster-II cable (which can be purchased at http://www.customcircuitsolutions.com/cable.html or http://fpgaguy.110mb.com/, for instance). This tool has only received limited testing, so please be careful and report any problems to the author. The FlexyICE can be accessed using its usb-to-serial chip (FT245B(M)). For Windows and Mac OS, you need a driver for the chip, which can be found at the chip vendor's website. If you use Ubuntu, make sure to uninstall brltty (apt-get remove brltty --purge) before you hook up the FlexyICE; otherwise it will hijack the FlexyICE and you won't be able to talk to it. Brltty is a software braille terminal. Images are downloaded via USB. With the latest version of the VHDL (v5), it should take about 8 seconds to write a 512KByte image to the FlexyICE. The -v parameter makes the command verbose. -c /dev/ttyUSB0 means 'use device /dev/ttyS0'. Alix0-1.bin is the image that is to be written to the FlexyICE (it's a 512KByte file), and 3584K is the offset at which it should be written. Always calculate that number as 4Mbyte - size of your image. The -r parameter indicates 'read', and 3670016 is the offset at which the program should start reading (this is 3584K), for 512K bytes. You can express the offset in decimal (like in this example, in hex with a leading 0x, or in abbreviated decimal - for instance 3584K). Test2.rom is the file the image will be stored in on your computer. If you actually wrote and read an image, you should now md5sum both files to make sure they are identical. In the above, pin 7 on the FlexyICE should not be connected to anything on the ALIX.1C. Pin 9 on the FlexyICE should be connected to one of 2/4/6/8/10/12/17 on the ALIX.1C, not all of those pins. Pin 15 and 18 on the ALIX.1C side need to be shorted, but not connected to anything on the FlexyICE side. Cable length is important - your cable should not be more than a few centimeter long. 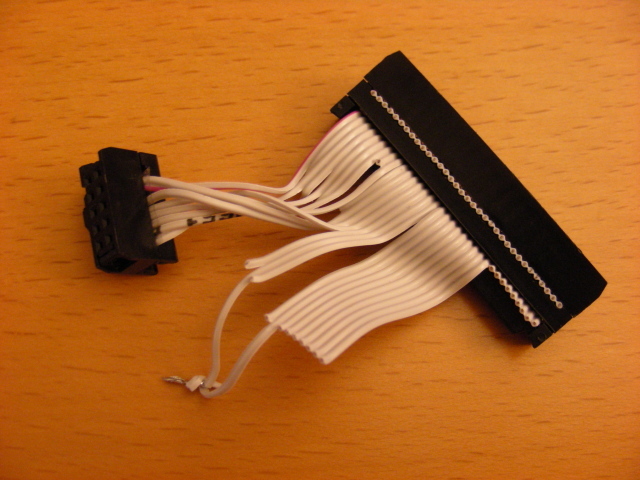 The easiest way to make such a cable is to take an old floppy or IDE-40 flat ribbon cable (don't use IDE-80, its wires are much thinner which makes things harder), cut it, and put a 10-pin header on the FlexyICE side. If you are in the US, you can buy 10-pin headers here (Jameco part number 32492). You might also want to get a crimping tool (Jameco part number 73252). You can test your cable by booting the ALIX.1C, and then hooking it up to the FlexyICE (using J16 on the ALIX.1C, of course). Now reboot the ALIX.1C board; the LEDs on the FlexyICE should show post codes as the ALIX.1C shuts down and tries to boot. Unless you've prepared the FlexyICE and stored an image into it, the ALIX.1C will not boot. But if you see POST codes on the LEDs, your cable is likely to be good. If not, use a multimeter and make sure it matches the layout above. Also make sure that it is not too long. Jump pin 1/2 on J1. Make sure JMP4 is set to position 1/2 (i.e. NOT to the pins marked as LPC). Make sure that you leave the mode select jumpers in the same position between the writing of the image into the FlexyICE and trying to boot off it. Now write your image to the top of the memory bank you want to use (see higher). Then disconnect the FlexyICE from your computer, reconnect it, make sure that you have your cable connected to the LPC port on the FlexyICE and J16 on the ALIX.1C, and plug in power to the ALIX.1C. Also hook up a serial port to the ALIX.1C so that you see what happens during boot. If all goes well, you will see post codes on the FlexyICE LEDs as the ALIX.1C boots. It is also possible to boot FWH PLCC boards, if you make a special cable. For an example of such a cable, see some photos here: http://www.artecdesign.ee/~martr/dongle-fwh-plcc-cable/. TODO: we need to find a place to buy such a connector, and we need to document the pinout of the cable. With a VHDL change and the proper cable, it should be possible to use the FlexyICE to boot SPI-based boards. Artec is considering this as a planned feature for FlexyICE II VHDL - when that is done, interested parties can try to backport the relevant open source VHDL parts. This page was last modified on 14 April 2015, at 06:11.